Google's Android software is about to make the leap beyond smartphones and tablets. The tech giant unveiled a new watch, as well as ways for Android to be used for television and cars at its annual I/O conference for software developers Wednesday. The company, as widely expected, showcased its new smartwatch-ready "Android Wear" software. Google (GOOGL) revealed plans for Android Wear in March, but developers have been anxious to get details on its planned features and specifications. The company said that Android Wear will use voice commands, let you swipe between screens, work with apps on your phone and feature voice-driven note-taking. Siri-like question answering lets you see who's calling you and can allow you to send messages from the phone and set reminders. Apps are installed via your phone and sync automatically. Google added that a watch from LG will be available to order later Wednesday on Google's Play store. Samsung is also joining the Android Wear family with the Samsung Gear Live, also available to order later Wednesday. The Moto 360 watch will be available for sale later this summer. Android TV: Google also announced a forthcoming platform for controlling your television called Android TV. "We're giving TV the same level of attention that phones and tablets have previously enjoyed," said Dave Burke, director of engineering for Android. The software lets you control your television with your phone or smartwatch, offering a simple interface for choosing among movies, TV shows, apps and games. 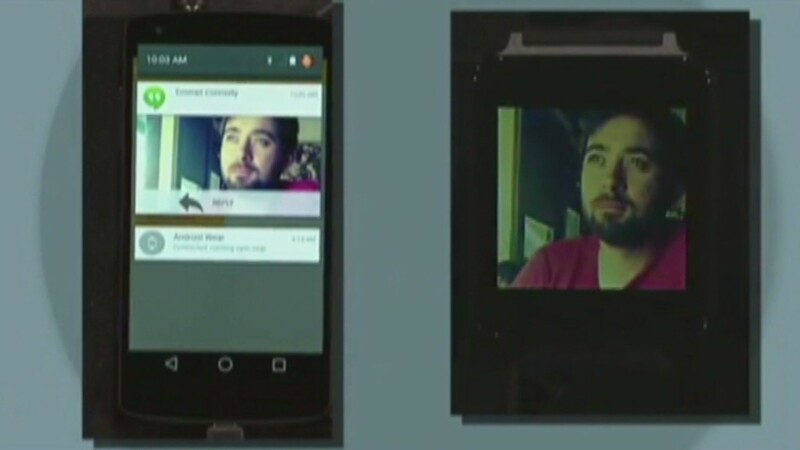 It also responds to voice commands and queries and lets you mirror Android phones and tablets on your TV. Set-top boxes running Android TV will be available this fall from Asus and Razer, while companies including Sharp and Sony are working on televisions using the platform that will be released within the next year. Android in your car: There's also Android Auto, which syncs with your smartphone and lets you control apps with voice commands and steering-wheel buttons while you're driving. You can get directions via Google Maps, play music and respond to phone calls and text messages without taking your hands off the wheel. Over 40 automakers have signed on to bring the software to their vehicles, Google says. Developers learn more about Google L. The conference began with a preview of features available in a new version of Android -- known for now as Android L -- that's set for release in the fall. The software offers a feature Google calls "material design," which gives the illusion of varying elevation for images on the screen. It also allows users to set up a "personal unlocking" system in which the phone won't require a passcode when it senses that it's in a trusted location or detects your Bluetooth-enabled wearable devices. Google says there are now 1 billion monthly active users of Android globally, up from 538 million a year ago. Last year's I/O event was a showcase for Google Glass, the company's head-mounted computing device. Google recently announced a series of "developer partners" for Glass, including companies working on medical, business and media applications. It's currently seeking other partners as well. The I/O conference has also tended to be a lot quirkier than events hosted by Apple (AAPL), Microsoft (MSFT) and other rivals. In addition to the product-focused events, this year's gathering includes sessions ranging from the offbeat (a briefing on Google's Santa-tracking technology) to the futuristic (a lecture from Ray Kurzweil, the sci-fi author and inventor who heads Google's machine intelligence efforts).